Villa Park Civic Association site! The Villa Park Civic Association (VPCA) is a neighborhood civic association in the City of Trenton, County of Mercer, State of New Jersey, and is established as a New Jersey non-profit organization and a 501(c) tax-exempt, non-profit organization under U.S. tax laws. Villa Park consists of that portion of City of Trenton, County of Mercer, State of New Jersey bound by and inclusive of the east side of Chambers Street, the south side of Hamilton Avenue, the west side of South Olden Avenue, and the north side of Liberty Street. The purpose of the VPCA is to enhance the quality of life in Villa Park, and to promote a cohesive community of residents, businesses and institutions. 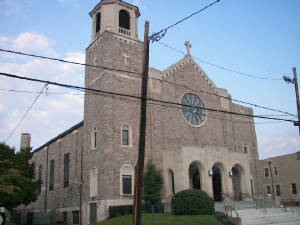 St. Anthony's Church on Olden Ave.